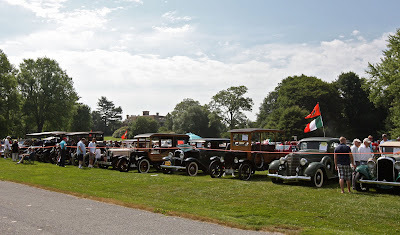 I stopped by Old Westbury Gardens for the classic car show this past Sunday and I thought I might as well take a few shots of the house since it was so nice out. 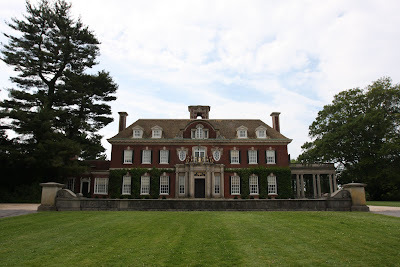 So above and below are more of 'Westbury House', the John S. Phipps estate designed by George Crawley c. 1905 in Old Westbury. Click HERE for more on 'Westbury House'. looking at all this perfectly preserved stuff at westbury makes talbot house all the more poignant. the talbot house for all its crowding is so together - the ceilings, for example, all have the same theme. i love this blog but hate seeing things like that and the ones that were wnatonly demolished. to quote the witch in the wizard of oz - " what a world, what a world"
i am in total synch with talbot tho (and i bet dilletante feels it too). the urge to collect can't be denied and once you're hooked, it makes addictive drugs look like cotton candy. you know you don't need that sedan chair or one more table and it will make the room look REALLY crowded but there it is and don't you just love it. Actually, Turner old boy, being in the business keeps my own collecting urges to a minimum---I get to buy and possess without having to worry about permanent placement and long term care. My own house is about as spare and edited as it gets. 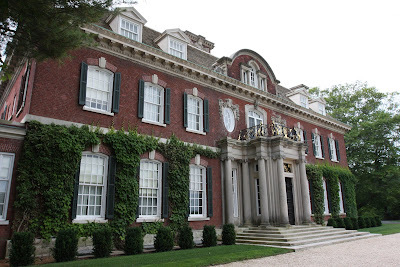 But I do love other people's opulence, and Old Westbury certainly is a lovely bit of it. The sad truth is that one can't save everything, and that actually not everything is worth saving, but Westbury is an unusually good and complete example, and thank goodness that Mrs. Boegner had the combination of sentiment, foresight, and funds needed to make this happen. Agreed! Another picture of Westbury never hurts! No matter how many times I see it, and from whatever angle, it never fails to take my breath away a little bit. It is a great stroke that this one has bee preserved and so beautifully and fully! There still has been no mention of the indoor tennis court that once existed in the woods east of the house and north of the pond. It can be seen in the 1966 and 1980 HistoricAerials.com photos, but, alas, had become a clearing in the 2000 photos. I've seen it on many occasions and my brother was lucky enough to have played on it before it was torn down. As for the estate itself, masterpiece is the only word that comes to mind. The house is beautifully proportioned, with livable scale, light airy comfortable rooms devoid of the (chair) mayhem seen in "Talbot House". The grounds are magnificent. The collection of "outdoor rooms" is an invitation to explore. The mile long alee of trees emanates from the house and stretches south to Jericho Turnpike and north to the LIE. The trees lining the driveway and beyond (across the road) seem to go on forever. One finds new vistas at every turn and is constantly in awe. 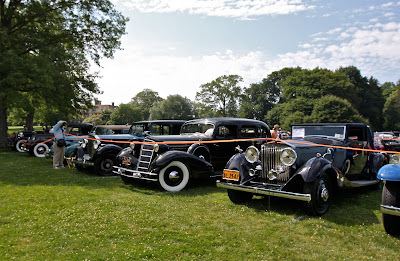 Despite visiting the property on countless occasions, (the antique car shows and summer evening picnic/pops concerts were among my favorites), throughout the seasons there always seems to be something new to discover. 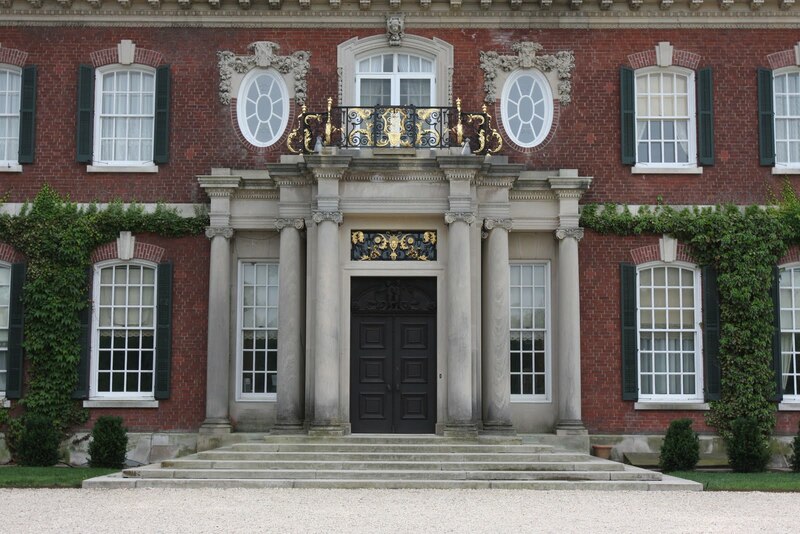 The impressive thing about Westbury House was that John Phipps built it as a home for Mrs. Phipps and their children vs. as a monument to himself. We are fortunate that Old Westbury Gardens has been preserved in (close to) its original state and can be enjoyed by the public. Despite today’s economic pressures, this special place has remained a model of preservation thanks to the foresight of the Phipps family and the dedication and generosity of its many members, volunteers and employees. Thanks for the insights & another tennis house to add to the list. I felt sure that there were more Phipps playhouses but couldn't identify where! Look forward to further reminiscences from you as something jogs your memory. I'm going through Talbot House withdrawals! I could never in my eyes confirm the location of the court at OWH. Is this the location? Its possible you can see structure going back to 1994 at Google Earth. It looks to be more then just a rectangle box. Was it designed with hints of the main house? Pictures, Details???? Why would they destroy this one? I checked with my brother and while I recall the exterior covering of the Wesbury House indoor tennis court as being naturally weathered shake shingles, he was not sure. He recalls that in addition to the basic rectangle, it included adjoining lounge facilities in the front and a small (tennis court caretaker's) apartment attached to the back. Your Google Earth location is spot on. As to why they would destroy it, simple economics is the most logical explanation. Maintenance, wages, utilities and property taxes would be very high on such a structure, especially if it were being under-utilized and/or if it produced no offsetting revenue (like renting it to a tennis pro). A nonprofit organization such as Old Westbury Gardens often has to make difficult choices regarding the optimization of its limited resources. I'll bet that somewhere in the Old Westbury Gardens photo archives, there exist pictures of the indoor tennis court complex. While we're on the subject of indoor tennis courts, check out Dilletante's 6/8 blog for some great pictures (circa 1948) of the Oak Point complex (after the tennis court was turned into a conservatory by Mrs. Williams). Tangent is the word of the day. Ever since I found the Oak Point complex I've taken the time to Google her name and have kept wanting to find more. Capri anyone? An Aesthete's Lament had a link to something about this place????? The video link above was new in April. Half Pudding, I have photos from May 1948 of the playhouse at Oak Point, inside and out, and photos of her house at Capri. 2 of the Oak Point photos are on my blog today, in a post called Everywhere I look. I also, somewhere, have a picture of her New York drawing room, in a book temporarily packed while my office is being painted, Email me and I'll be glad to send anything you might want. What am I thinking? I'll send the Oak Point pics to Zach, who can post them. Duh. That Rolls was definitely one of the nicest cars there. Mint condition. And I would be more than happy to post some pictures of Oak Point. I remember the tennis court building at OWG, and I believe that O(F)LI is correct: it was a wooden structure in green shingles. I also remember that it was in pretty bad condition and appeared not to have been used in years (this was in the 1980's). As those of us cursed with lovely old frame houses know, it doesn't take many years of benign neglect to reduce a once proud structure to a leaking, peeling, rotting mess. If my memory serves me, the surrounding trees had grown up around the playhouse and the resulting shade and damp must have hastened the decline. With not unlimited funds at their disposal, it was probably a fairly easy decision for the trustees of OWG to do away with the building. Given how well they keep everything else, I don't fault them. And HPHS- Mona Bismark was, by all accounts, one of the world's most stylish, enigmatic women. Whether she was interesting as a person or not, who knows. Here are some great reads about her, if you're interested: Famous Jewelry Collectors by Stefano Papi; Bismark, Balenciaga et Beaton by the Mona Bismark Foundation (tout en Francais- God, I wish I had paid more attention in Mme. Guillemont's classes through high school)and the last, and best (prepare to take out a mortgage- hard to find) All American VII 'Til We Get it Right by Bruce Weber, of all people. It has a wonderful chapter on Mona Bismark, including great photos of Oak Point. I'd love to share and if anyone can tell me how (make it simple- I'm somewhat technology challenged) and assure me that I'm not infringing on copyrights, etc., I'd be happy to.